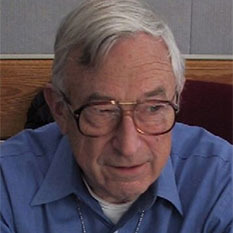 Art Vaughan studied engineering physics at Cornell University and received his Ph.D. in physics, mathematics and astronomy from the University of Rochester in 1964. He served for 17 years as a staff astronomer of the Mt. Wilson, Palomar and Las Campanas Observatories and 4 years at Perkin-Elmer in Garden Grove before joining JPL in 1985. In the late 1970s he provided the optical design for JPL-Caltech’s first generation Wide Field and Planetary Camera for Hubble Space Telescope (HST). After the HST was launched in 1990, he worked on the second-generation JPL camera that restored HST to full imaging capability, for which he received a NASA Exceptional Achievement Medal in 1993. More recently Vaughan served as optics manager for GALEX (Galaxy Evolution Explorer, a half-meter Earth-orbiting NUV-FUV telescope scheduled for launch in July 2002). Vaughan retired from JPL in 2001. He remains active on the Board of Directors of the Mt. Wilson Institute, operator of the Mt. Wilson Observatory, of which he is co-founder. Vaughan is a Fellow of the International Astronomical Union. He holds two patents and has authored some 60 publications. Photo and biographical information from the Optical Sociey of Southern California.